The plantar fascia is the tissue that connects your heel to your toes. It has an important role in supporting the medial arch, or inside portion of the foot, especially during walking. It also provides shock absorption, approximately taking on two times the body’s weight during normal walking. Plantar Fasciitis occurs when the plantar fascia becomes inflamed. Biomechanical – People who have low arches (pes planus) or high arches (pes cavus) can be predisposed to plantar fasciitis. However, studies have shown that people with plantar fasciitis are 81-86% more likely to have low arches. Heel spu rs are often mentioned in connection with plantar fasciitis. Heel spurs are most often the result of increased tension on the heel from the attachment of the fascia. The presence of a heel spur does not define a diagnosis of plantar fasciitis nor does it indicate such. One study showed that only 13% of people with plantar fasciitis had a concurrent heel spur. Occupational – There has been found to be a connection between plantar fasciitis and prolonged standing and walking. People who have jobs that require a lot of standing, such as policeman, can cause repetitive stress on the fascia. Also, a sudden change in the amount of stress placed on the feet, like training on an unyielding surface such as a tennis court, can cause plantar fasciitis. Obesity – Studies have shown that obesity occurs in approximately 40% of men and 90% of women with plantar fasciitis. Also, a sudden loss or gain in weight can impact the amount of stress placed on the plantar fascia. Reducing Pain and Inflammation – Your doctor can prescribe medications for you that will help reduce inflammation and pain. Corticosteroid injections into the region of pain and nonsteroidal anti-inflammatory medication are the most commonly prescribed medications for plantar fasciitis. Also your physical therapist can use a variety of physical agents, such as cryotherapy, ultrasound, iontophoresis, and soft tissue mobilization to help reduce pain and assist in the natural healing process. Reducing Tissue Stress – The most common management strategies used to reduce tissue stress have been proper prescribed footwear, taping, orthotics, and night splinting. All of these interventions are attempts to reduce the amount of pronation, which occurs excessively with people with low arches, reducing the stress on the plantar fascia. 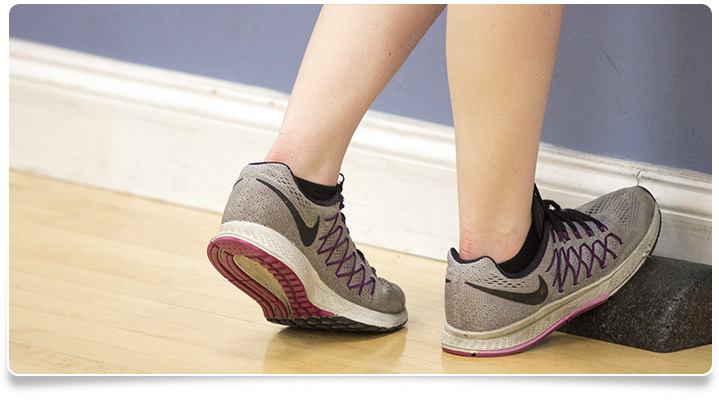 Restoring Muscle Strength and Flexibility – Most clinicians and researchers believe this is the most important intervention when treating plantar fasciitis. Stretching of the calf muscles along with the plantar fascia itself helps elongate those tissues and reduce the stress caused on the fascia. There are a variety of different stretches that your therapist can prescribe for you. Also, strengthening the muscles surround your foot/ankle can also help provide stability to the arch of the foot and reduce stress on the fascia. It is widely agreed upon that surgical intervention for plantar fasciitis is only indicated if conservative management has failed. There has been no set time limit but most surgeons will allow 4-6 months of conservative treatment before considering surgical intervention. Most typically, surgical treatment would include either an open or endoscopic plantar fasciotomy. An open procedure would include a 3-6cm incision with a release of the fascia, and excision any heel spurs which may or may not be present. It has been reported however that approximately only 5% of patients diagnosed with plantar fasciitis undergo surgery. Only your doctor or physical therapist can tell you if you have plantar fasciitis. However, there are some common signs and symptoms. The most common is heel pain which is aggravated by weight bearing and often relieved by non-weightbearing. Patients will also often complain of pain when arising from bed in the morning, which often slowly subsides 30-45 minutes later. There are other conditions that can cause heel pain so it is important that you consult with your doctor or therapist to get an accurate diagnosis. Facing a wall, put your hands against the wall at about eye level. Keep one foot back with heel on ground and slowly lean in until you feel a stretch on back of calf. Hold for 30 seconds. Grab your toes and pull lightly until a stretch is felt on bottom of foot. Hold for 30 seconds.